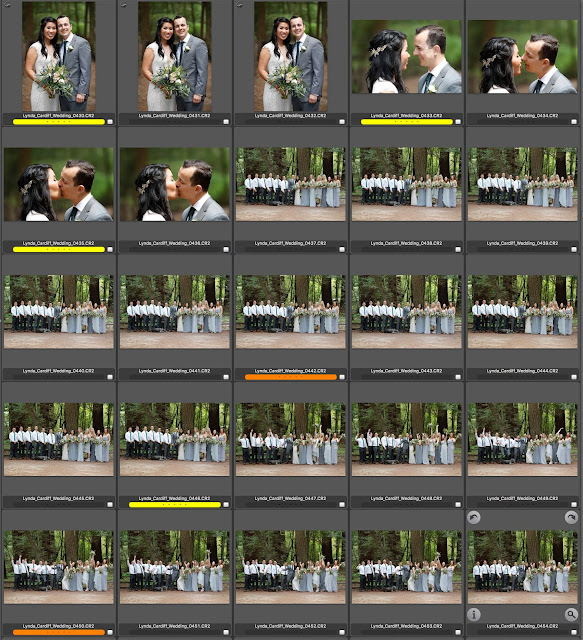 Jeff Cable's Blog: Photographing a wedding by yourself - Part V - Post processing: How I cull through thousands of images quickly! Photographing a wedding by yourself - Part V - Post processing: How I cull through thousands of images quickly! I thought that the last blog post was the final in a four part series about photographing a wedding. But I had numerous people ask me about my post processing workflow, and how I cull through 4000 photos and post the images by the next afternoon. So...I guess my four part blog is now going to head into part five! * Duplicates - since I almost always shoot multiples of every shot, I end up with duplicates. I go through all the images in Photo Mechanic tagging the images I want to delete. I then hit "Command T" to select all tagged images and delete them. This whole process usually takes about 45 minutes. Now that I have my keeper collection of images from the event, I select them all and then hit "Command M" in Photo Mechanic to rename them. 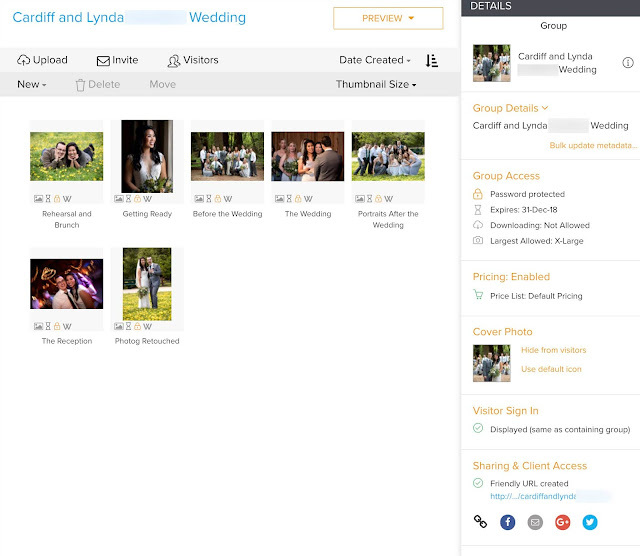 If it is the Hamilton wedding, then the first file name will look something like this: Lynda_Cardiff_Weddding_0001. I don't use spaces in my file names since some web sites or applications don't like spaces, so I use underscores. * Orange (hitting 3 on my keyboard) - this is a stand out image and one that I will likley edit for the client in advance and possibly keep in my portfolio. * Red (hitting 2 on my keyboard) - this is a real money shot! and will definitely end up in my portfolio and on my web site. After shooting so many events, and being very selective, this is a rare occasion when I get an image that is so epic that it deserves a red mark. But I still push myself to get them. When I am done picking the keepers from the entire gallery, I then hit "Command S" to save all the images as small JPEGs. 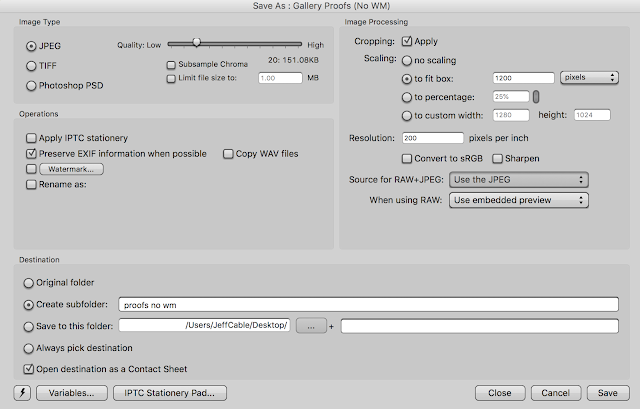 I already have a preset created in Photo Mechanic called "Gallery Proofs" which sizes the files to 1200 pixels, compresses them at JPEG level 3, and puts them in a subfolder called "proofs". 1. I want the to show the client how the finished products will look. 2. These are images which I will watermark and send to the client in an email for them to share with family, friends and on social media. 3. These are images that I want to retouch for my own portfolio and to share on my social media channels. Finding the best images to retouch is simple. In Photo Mechanic, I filter out all images that are not ranked or are ranked as yellow. That leaves me with only the orange and red (if there are any marked red). Ta da! I now see my ultimate favorites in the collection. If I am lucky enough to have too many to retouch, I will then scan through these to determine which ones I will retouch. Typically I will retouch anywhere from 10-20 depending on the event. To do this, when on that image I hit "E" on my keyboard and Photo Mechanic will launch Photoshop (well technically Adobe Camera RAW) for me, so that I can properly retouch the photo. I then color code all my retouched images in purple (hitting 1 on my keyboard). I reserve purple only for full finished images, making it very easy to find them in my folders. I then select all the purples and hit "Command S" again, but this time I choose another preset called "Photog Retouched". Basically all the settings are the same as the "Gallery Proofs" preset except that the images go into a subfolder called "photog favorites". 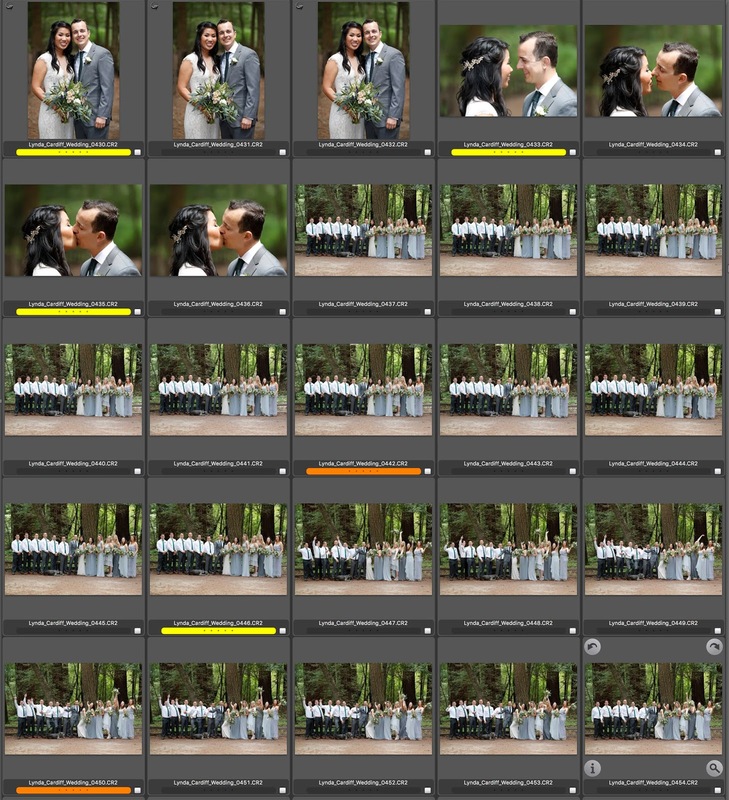 At this point I am ready to upload all the images to my client gallery in Zenfolio. Because I have resized the images to small JPEG files and compressed them heavily, they upload really quickly. This process takes only a couple of minutes. Then, in Zenfolio, I customize the client's gallery url, create a password, set the duration for their gallery to be online, and send the client and invitation to see their proof images. And no, I am still not done yet! Once I have their invitation sent, I then create a separate email for the clients with the retouched images at 900 pixels and with my logo on them. In order to put the logo in the best place, I have created a brush in Photoshop that is my logo. This makes resizing, placing and changing the logo color so easy! I encourage them to share these small images online since this is great way for everyone in their network to see my work. At this point, I am almost done, and breathing a sigh of relief. I am almost ready to step away from my computer and say hello to my family. But I have one more VERY important step to complete. 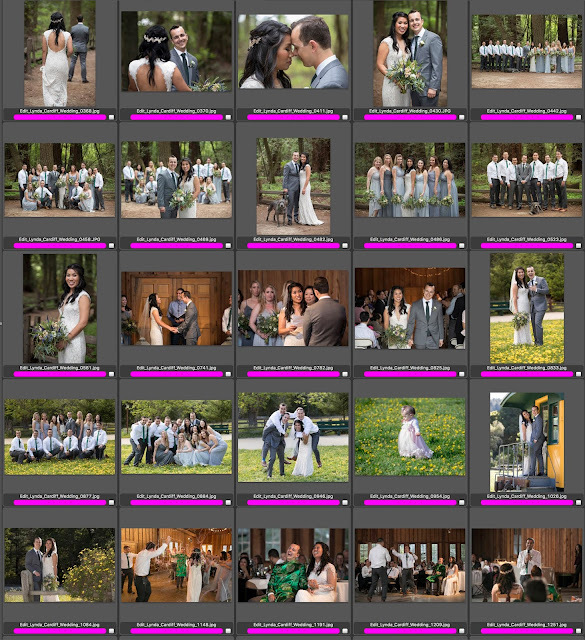 At this point I have a folder with all the client's RAW files (many of which I have selected for the gallery and some not) as well as the images I have retouched. Everything is renamed, ranked and ready to be backed up. 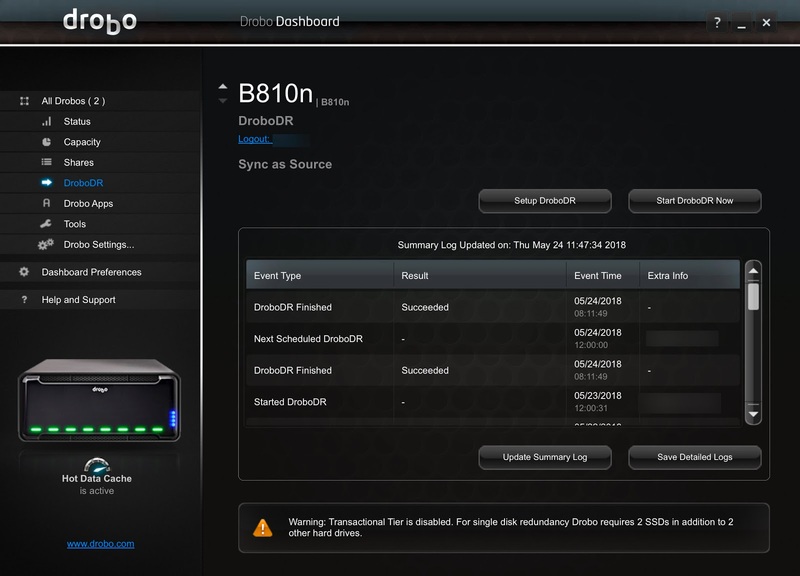 I then drag that completed folder (likely to be 30GB or 40GB in size) to my Drobo 810n NAS drive. This provides me with the ultimate peace of mind knowing that my images are not just on one drive. But since I have another Drobo 810n offsite, which synchronizes every night at 11pm with the one in my studio (using the included Drobo DR software), I know that later that night all those same images are now on three different drives. And that my friends is how I work almost every Sunday morning. I hope that this helps all you photographers out there. I know how time consuming all this can be. By refining your workflow, you can minimize your time at the computer and spend more time behind the camera. But even more importantly, you will be able to deliver images to your client's faster and make them happier, which in turn should result in more business for you! Not clear on what 'retouching' you can do in photo mechanic. When you choose your 10-20 to retouch, do you go to other software for that? Thanks, very informative. Thank you for posting this series Jeff! NIce photos. But it is not clear to me that how we use that tools and when? It will be so kind of you if you tell me the quarries. Otherwise nice post. Thank you. do you also Lightroom or another cataloging software? or is it enough for you to rate them with photomechanic and create Folder for the Events etc. ?